PIP – Permanently Irritation Persecution? Whilst our mainstream media continue with the media circus about the USA presidential nominations, the referendum on EU membership and the false allegations of anti-Semitism against those who support the Palestinians rights. Concerns have been raised by landlords, that those on Universal Credit, are in rent arrears? Which will come as no surprise, to any one with any commosense! We still have a Government still hounding the least able in society. Whilst the rich get away with false expenses applications and avoiding tax. Money is wasted hounding the poorest in society, instead of assisting them and making their lives more worthwhile. A society which sits-by and allows the persecution and ridicule of the poor and meek, is not worthy of calling itself civilised! Source: PIP – Permanently Irritation Persecution? 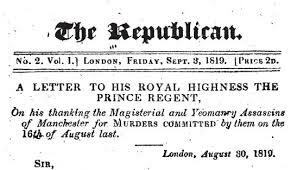 We have gone back in time, to a period similar to that written about by Robert Tressell in ‘The Ragged Trousered Philanthropists‘! And yet, we are now in the 21st Century. How has this been allowed to happen, where are the opposition political parties? Unfortunately, the use of percentages (%) instead of hard figures is used within all Government departments including the NHS (National Health Service). Even the Health Protection Agency HPA), in their reply to a planning application for a biomass incinerator in Davyhulme, Trafford. Stated it was acceptable because it would only increase the local death rates by 0.06 per year. application predicts that the particulate emissions from the plant would result in a 0.011% increase in deaths brought forward (paragraph 12.180). This is also expressed as 0.06 deaths brought forward per annum for this population. The applicant considers this impact “would not be noticeable”. Of course, any increase in the local death rate is totally unacceptable. And, yet we have a Government department, the HPA, supposedly responsible for the protection of human health finding it acceptable. Though they put it as, ‘would not be noticable’! We also have the use of percentages, when they talk about ‘fracking fluid’. The highly toxic cocktail of water, sand and chemicals they use in high-pressure hydraulic fracturing of shale gas. Hydraulic fracturing for shale gas is likely to involve the use of large quantities of clean water, typically 10,000 to 30,000 m3 water per well (10,000,000 to 30,000,000 litres). Which is mixed with sand, around 5% and other fluids at around 2%. Which makes it sound as miniscule amount, until you do the maths and 2% = 300,000 to 600,000 litres of highly toxic and carcenigenic fluidsbeing added. Which has the potentail to seep into aquifers and pollute drinking water. As the blog below ststaes, it is time the Government stopped hiding behind percentages, and gave clear figures that people can clearly understand. “Numbers should be a light, not a crutch”. USA and Israel are the pariah states which should be before the International Court of Justice. “The one who needs to fear the International Criminal Court in The Hague is the Palestinian Authority, which has a unity government with Hamas, a terror organization like [the Islamic State group] which commits war crimes.” So says Israel’s Prime Minister Benjamin Netanyahu. This certifiable crackpot, this bloody butcher who tops the world’s ‘most wanted’ list, was speaking after Palestinian leader Mahmoud Abbas signed the Rome Statute, at long last joining Palestine to the International Criminal Court (ICC). Membership of the ICC could enable the Palestinians to file charges against Israel for war crimes. Labour Party – the biggest bedroom tax incompetents – IT COSTS MORE you idiots!! Both main political parties, Labour and Conservative have only one mandate, to enrich the already rich. Both parties have shown their incompetence in office, their failures to address climate change, tax avoidance and evasion, and of course the continuing failure of our banks. It is time, those who do not vote, got out their and vote for any other (preferably the Green Party), to rid us of these fools. Your vote (which people died for) is totally useless, if you do not use it. This coming General Election, get out there, encourage family, friends and neighbours to vote, anything but Labour and Conservative. Labour = Conservative = A continual cycle of failure. It was with sadness that I heard Pat Burke had died on the 26th November 2014. Pat Burke had been active in Ancoats for many years, recently supporting Ancoats Dispensary Trust, in its efforts to save Ancoats Dispenary. 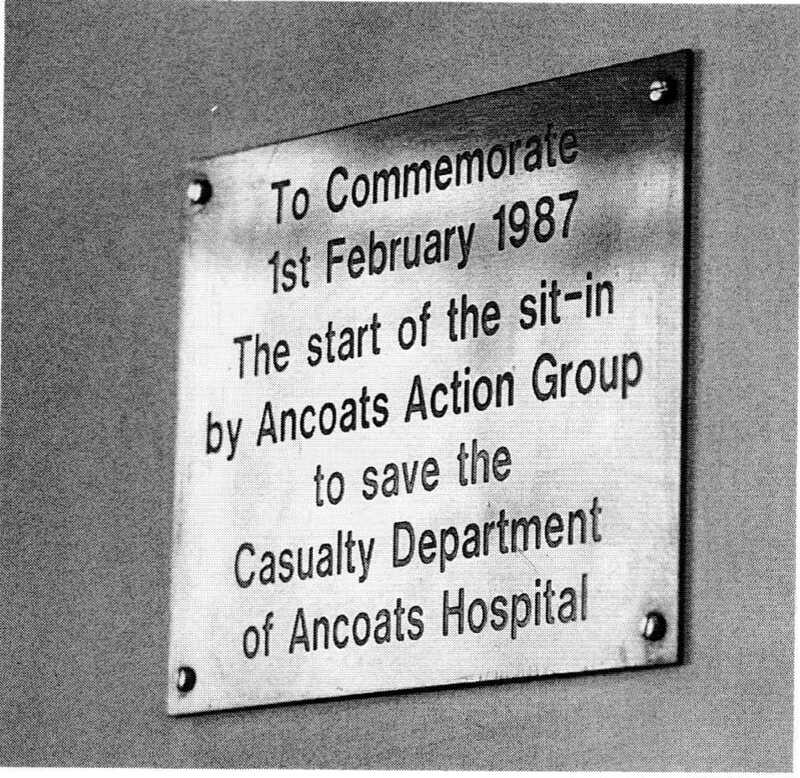 She was involved, with other Ancoats residents in the occupation of Ancoats Casualty, which took place between February 1987 and March 1989. They were fighting to stop the closure of the casualty department, which the local Health authority had decided, had to close. The story of the sit-in, is told in ‘Stitched Up! 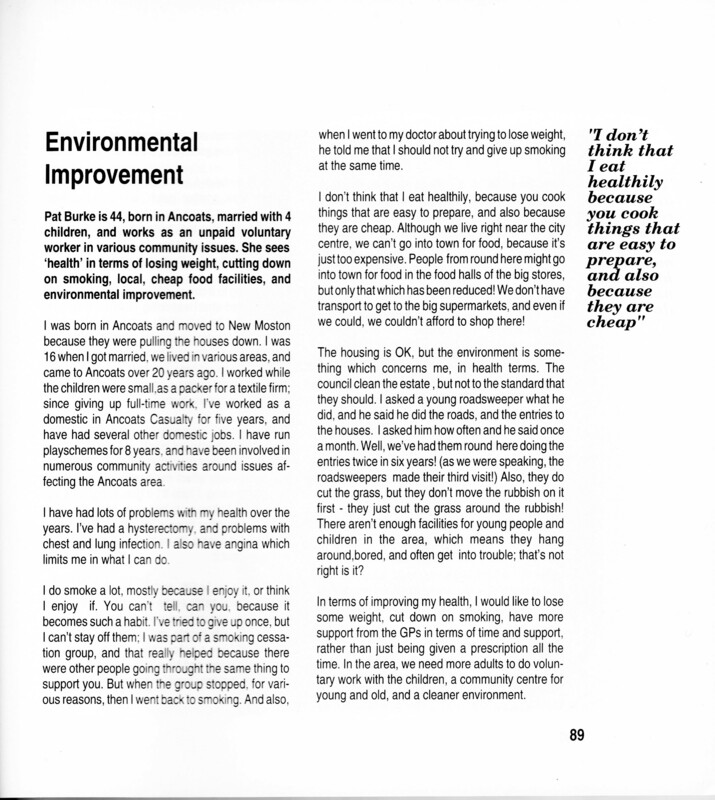 – Action for Health in Ancoats’ (Dunne, M.C., 1993). 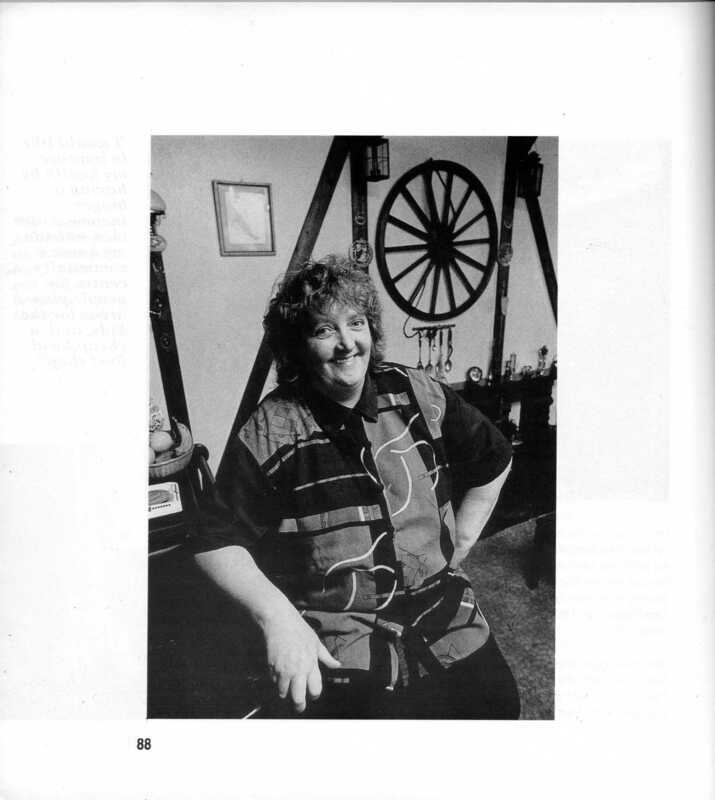 Pat was one of the editorial group, along with Phil Burke, Joe Cromer, Jean Grey, Cathy Jackson and Craig Russell, which met regularly between 1991 to 1993. There were two copies of ‘Stitched Up!’ available in the reference section of Central Library. Dunne, M.C. (1993) Stitched Up! – Action for Health in Ancoats, Rochdale Alternative Press. 1993 Church Action on Poverty. Manchester City Council continue to show, that they are overwhelmingly not acting in the residents best interests, once again ignoring it’s electorate. It has almost total control of the council and acts as a dictatorship. This is to ensure that Bernstein and Leese build their ivory towers, ensuring the City of Manchester, is all fur-coat and no knickers: Mersey Valley warden service facing the axe. Two must-read articles about Alexandra Park, where the chainsaws are moving in… (See our previous editorial on the subject here). Manchester Green Party Chair Deyika Nzeribe commented “The campaign group has done everything right. They got over 2000 signatures asking for the plans to be reconsidered, they got local experts to show how the councils plans to be altered to preserve trees and they have been in dialogue with both the Council and funders the Lottery every step of the way. They have been completely ignored. New young Israeli Refusers | The Only Democracy? Not all Israelis believe in the states mission to ethnically cleanse Palestine of all Palestinians and Bedouin. And the violence, human and civil right abuses committed by state. Hopefully they will overcome the old powers and install a real democracy. New young Israeli Refusers | The Only Democracy?.